FORT LAUDERDALE, FL--(Marketwire - April 20, 2010) - It's state of the art technology that fits right in your pocket, the epitome of a James Bond gadget. The TungstenW Biometric wallet will launch April 21 as part of "The State of Gadget Media" event, hosted by paidContent.org in New York City, forever changing what the world knows about personal security. 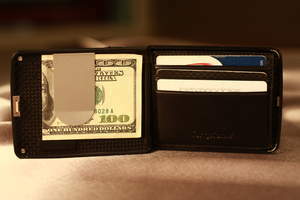 The TungstenW is a marvel in cash and credit card-carrying technology, made completely out of space-age Carbon Fiber. First used in the aircraft industry, the nearly indestructible material keeps your money and personal information safe and secure. The biometric fingerprint reader ensures only the owner can access the contents of the wallet. The TungstenW can also be paired with any Bluetooth enabled cell phone. The TungstenW automatically triggers a loud alarm whenever the wallet and cell phone become more than 10 feet apart, immediately alerting the owner that their wallet or cell phone is lost or stolen. "Over 40% of identity theft begins with a lost or stolen wallet," said Marvin Chaney, CEO of Aegis Innovations and founder of TungstenW. "TungstenW will serve as your personal mobile vault, so you won't have to worry about being a victim any more." Top technology writers, bloggers and gadget lovers are expected to be on hand as the TugstenW is revealed. They'll be able to preview its technology first-hand, ask questions and volley ideas with other like-minded technology buffs. "'The State of Gadget Media' (http://paidcontent.org/event/the-state-of-gadget-media/) is the perfect opportunity to showcase exactly how the TungstenW works," said Matt Pici, TungstenW Director of Business Development. "These are the people who will spread the word about its remarkable features and incredible technology. We want to show them that TunstenW is truly the future of personal privacy and security." The TungstenW Biometric wallet is the premium choice in luxury, cash & credit card-carrying technology. The sleek hard-cased, tamper-resistant wallet is constructed of Carbon Fiber, a lightweight space age material that is five times stronger and two times stiffer than steel. The Biometric fingerprint reader keeps the contents secure and private and easily pairs with any Bluetooth enabled cell phone to trigger a notification alarm when the TungstenW travels approximately 10 feet from the owner's cell phone helping ensure you never leave your TungstenW wallet or cell phone behind. The radio frequency identification (RFID) theft protection helps prevent thieves from scanning any credit cards, passports and ID cards that contain RFID chips. Perfect for travel, the wallet is even large enough to hold jewelry, keys or other valuables, but small enough to fit in your shirt, jacket or pants pocket. The TungstenW Biometric wallet will appear in several high-end luxury Christmas catalogs this winter. Dimensions are: 3 3/8" Width x 4 1/4" Length x 3/4" Thickness. Retail price for the TungstenW Carbon Fiber case is $599.00. To purchase, please visit www.tungstenw.com. Aegis Innovations is the parent company of the TungstenW Biometric wallet, and RoboVault, the world's first state-of-the-art robotic storage facility located in Fort Lauderdale, Fla. RoboVault protects valuable possessions including fine art collections, jewelry, exotic vehicles, wine and more. The building is virtually impenetrable and indestructible, with cutting-edge, built-in biometric security systems, defense technologies and storm resistance up to Category 5 hurricanes and able to withstand wind pressure up to 200 MPH. RoboVault's technology identifies the user and prompts the robotic system to transfer valuables from a secluded area in the building where there is no human access to a private secure setting on the ground floor. Services include fine art and antique handling services, premium vehicle services, streaming video access and detailed reporting with digital photography. For more information, please visit www.robostorage.com. For media inquiries please contact Elizabeth Rose of Shamin Abas Public Relations, 561-366-1226 or elizabeth@shaminabaspr.com.